The Peace Museum of Mine Action in Siem Reap as seen from the air, in this photograph posted to Prime Minister Hun Sen’s Facebook page yesterday. The government’s main demining operator will open a 2-hectare landmine museum at an undisclosed cost in Siem Reap City today, at a time when the government is struggling to attract donors for mine clearance work that is well behind schedule. The Peace Museum of Mine Action, housed at the regional headquarters of the Cambodian Mine Action Center (CMAC), about a dozen kilometers from downtown Siem Reap, will give visitors a window into the history of one of the most heavily mined and bombarded countries in the world. 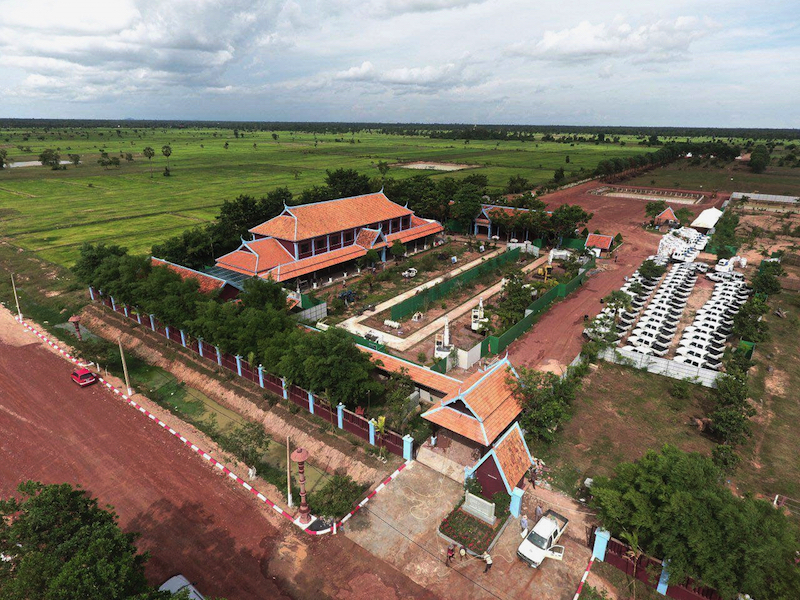 The Peace Museum of Mine Action in Siem Reap as seen from the air, in this photograph posted to Prime Minister Hun Sen’s Facebook page on Monday. Today’s inauguration is not so much an opening as an expansion. The headquarters already housed a large room packed with displays of some of the millions of mines, bombs and rockets recovered and defused from across Cambodia over the years. The new museum spreads out the inventory across the building with more spacious displays and dioramas of falling and fallen bombs. Outside are decommissioned excavators and other examples of the equipment used to clear them, and mock-ups of a war-era battlefield and a minefield being cleared. CMAC, by far the largest deminer in the country, hopes the museum will draw in some of the 2 million-plus tourists who visit Siem Reap each year on their way to the nearby Angkor temples. Mr. Ratana said it might start charging for admission after a few months but had yet to decide when or how much. A message posted to Prime Minister Hun Sen’s Facebook page on Wednesday says the museum was funded by the premier himself. Mr. Ratana said the government donated the land, but added that much of the money was donated by NGOs and development partners. He declined to provide even a rough estimate of the costs to build and run the museum and said it would be premature to identify the donors before the inauguration. The countries donating the most to clearing Cambodia include the U.S., Australia and Japan. A few other countries also donate through the U.N. and a handful of private operators. But after years—in some cases decades—of support, and new conflict hotspots redefining global aid priorities, donations are drying up. The roughly $10 million CMAC secured last year was nearly a third less than the year before. And work is far from over. Prosthetic legs for landmine victims on display at the Peace Museum of Mine Action in Siem Reap, as seen is this photo posted to Prime Minister Hun Sen’s Facebook page on Monday. Old mines and unexploded ordnance (UXO) killed or injured 83 people last year, and about half the minefields left behind by years of war have yet to be cleared. A report released late last year by the Geneva International Center for Humanitarian Demining concluded that, at the rate it was going, Cambodia was unlikely to meet its goal of being mine-free by 2025. But Mr. Ratana insisted there was no competition for funding between the museum and clearing mines. “Donors specifically support…this purpose; donors specifically support clearance,” he said. Mr. Ratana said the museum would also help CMAC continue and possibly build on the research it does on how to clear mines and UXO more effectively and efficiently. Denise Coghlan, a member of the Cambodia Campaign to Ban Landmines and Cluster Munitions, which advocates for the victims of mines and UXO, said it was hard to gauge the value of money being spent on the museum without knowing how much it cost. But she said it could have its benefits. But the Peace Museum won’t be alone. Siem Reap’s Cambodian Landmine Museum, a project of Cambodia Self-Help Demining, one of the country’s smaller private operators, opened its doors about two decades ago and moved to its current 2-hectare site in 2007. Bill Morse, one of the directors, said the facility also cares for 32 children on site and includes a working farm. The museum itself takes up about 2,500 square meters across four buildings. He said it draws about 30,000 paying customers a year at $5 a ticket. The money left over after covering its expenses goes to supporting clearance work and a rural schools project. Mr. Morse said he was not worried about competition from CMAC because his own museum had already carved out a unique place for itself by telling its story through the well-publicized and award-winning work of Aki Ra, the former Khmer Rouge child soldier who heads Self-Help Demining’s operations.